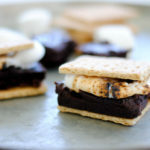 Since my husband is such a chocoholic, I’m always trying to come up with ways to satisfy his chocolate cravings. Me, on the other hand, I’m not that big of a fan of chocolate. At times, chocolate seems a bit too rich for me and I can only stand a few bites before I push the dessert to the side. We have such different tastes when it comes to desserts. He loves double mocha fudge ice cream and I like vanilla or strawberry ice cream. He loves chocolate cake with chocolate frosting and I like cheesecake with strawberries drizzled over the top. He loves double fudge brownies and I like…well, apple pie a la mode, if that even counts in comparison. 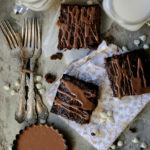 Due to his love of brownies, I came up with a recipe that is heavy on chocolate but light enough for me to enjoy with him. By using Hershey’s syrup, the batter turns out nice and fluffy and instead of being dense like normal brownies, this brownie recipe is more like chocolate cake. I’m telling you, it’s the best of both worlds. Recently, I had some extra cream cheese in the refrigerator so I whipped up cream cheese filling and added it to this dessert. I wanted the brownies to have a cream cheese filling that was dense; however, this cream cheese filling turned out to be much like the consistency of the brownie batter. Instead of starting all over with the ingredients, I decided to make…well, cream cheese filling out of cream cheese. After swirling the two batters together, I ended up with these lovely and decadent Cream Cheese Brownies that satisfied his sweet tooth…and mine too. Preheat oven to 350 degrees and prepare a muffin tin by either greasing over filling with muffin cups. Mix together one cup sugar, butter, syrup, eggs, and flour until smooth. Mix together the cream cheese, egg, 1/2 cup sugar, and extract. Pour brownie batter into muffin cups filling halfway. Pour cream cheese mixture over brownie mixture in muffin cups (1-2 teaspoons). 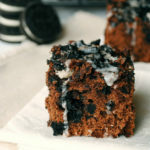 Pour 1 teaspoon of brownie batter over the cream cheese mixture. 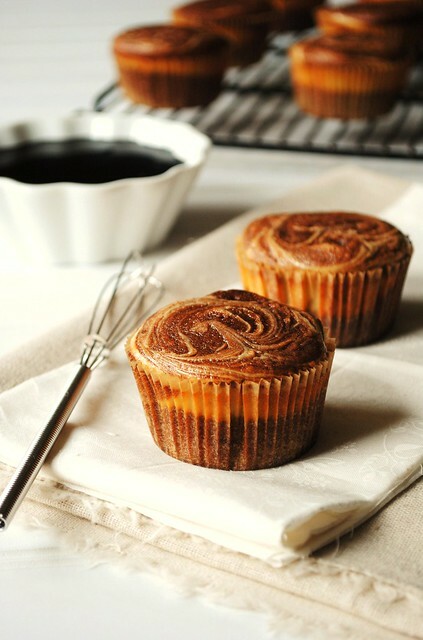 Take a toothpick and swirl the mixtures together in each muffin cup. Are you a chocoholic? What’s your favorite chocolate-filled treat? these look so good! i also am a chocoholic… give me anything chocolate as long as it doesn't have nuts! Definite chocoholic here but I have an equal opportunity sweet tooth. I like all those desserts that you & your husband like. :-) These brownies sound wonderful, and I like the idea of doing them as individuals in a muffin tin. Gorgeous Jen! These are my kind of brownie!! Have been following your blog for awhile but this is my first time to post. These brownies look lucious! I am going to try them using sprouted flour and Rapadura. I'll let you know how they turn out. Thanks for a great recipe! Jen, these are so pretty. It sounds like you came up with the perfect dessert to satisfy both you and your husband. This is absolutely gorgeous! Love your photo, i can see this in a cookbook or a gourmet magazine! 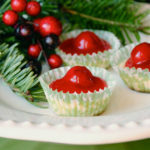 I love how you baked these in cupcakes liners! What perfect yet decadent individual cheesecake brownies! These look terrific! The photo is fantastic and I love the swirl! Wow. These look great! Thanks for sharing. I am definitely a chocoholic with many favorites. One of them is chocolate filled croissants. Yum. Your cupcakes look great. Why have I never thought to cook brownies in cupcake liners? Great idea! No cutting, no mess, instantly ready to serve. And way cuter! These look amazing! The swirls on top are so pretty! These look great! How many does this recipe yield? 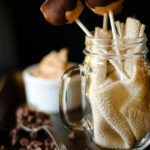 These look great and I want to make them…but just wondering, could I make these with chocolate chips instead of chocolate syrup?